Polish For the sake of viewer convenience, the content is shown below in the alternative language. You may click the link to switch the active language. Członek Ośrodka Badań Układów Złożonych i Nowych Technologii ISS. Member of the Center for Complex Systems and New Technologies ISS. Dynamics of the social interaction in small groups, empirical study of social emergence processes, patterns of coordination in groups, turn-taking structure, dynamics of teams communicating through synchronous media. Lisiecka, K., Rychwalska, A., Samson, K., Łucznik, K., Ziembowicz, M., Szostek, A., & Nowak, A. (2016). Medium Moderates the Message. How Users Adjust Their Communication Trajectories to Different Media in Collaborative Task Solving. PloS one, 11(6), e0157827. Nowak, A., Ziembowicz, K., Zabłocka-Bursa, A. & Bartkowski, W., (2015). Wpływ społeczny z perspektywy obiektu wpływu: teoria i modele symulacyjne. Psychologia Społeczna, 3 (34), 296-309. Lisiecka, K. (2013). Group as a unit of analysis. (In:) Nowak, A., Winkowska-Nowak, K., Bree, D. (eds.) Complex Human Dynamics (pp. 209-225). Springer Berlin Heidelberg. Nowak, A., Samson, K., Lisiecka, K., & Ziembowicz, M. (2011). Lovely weather, isn’t it? On the social dynamics of quality judgment. Mind and Society. A Journal of Cognitive and Epistemological Studies and Social Sciences, 10(2), 193-201. Lisiecka, K. (2007) Fraktalna wyobraźnia wzrokowa. [W:] Winkowska-Nowak, K., Rychwalska, A. (red.) Modelowanie matematyczne i symulacje komputerowe w naukach społecznych –podręcznik dla studentów I roku. 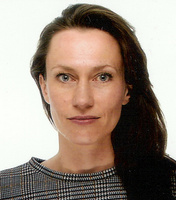 Lisiecka, K. (2015). “The structure of turn-taking in small group discussion” SYNCHRONIZATION Conference, Warsaw, Poland. Lisiecka, K. (2013). Interaction dynamics in teams communicating through synchronous ICT-based media. Complexity of Large Scale Phenomenon Conference. Lisiecka, K. (2013). Dynamika interakcji w zespołach zadaniowych komunikujących się za pośrednictwem synchronicznych mediów komputerowych. Peripatetic Conference in Cognitive Systems and Dynamic Psycholinguistics, Zakopane. Rychwalska, A., Samson, K., Lisiecka, K., Roszczyńska-Kurasińska, M., Kacprzyk, M., Gołąb, P., and Nowak A. (2013). When you should not trust? Modeling the role of coherence in groupthink phenomena ECCS. Lisiecka, K., Samson, K., Ziembowicz, M., Nowak, A. (2011) “Social dynamics of ICT-mediated interaction” ECCS 2011, Vienna, Austria. Nowak, A., Lisiecka, K., Samson, K. & Ziembowicz, M. (2010) The dynamics of quality negotiations. (Poster) Different Perspectives on Personality Psychology Conference. Jadwisin, Polska. Nowak, A., Lisiecka, K., Samson, K. and Ziembowicz, M. (2010) The dynamics of quality negotiations. (poster) European Conference on Complex Systems (ECCS). Lisbon, Portugal. Lisiecka, K. (2008). Nowak-Vallacher’s Mouse Paradigm – a tool for measuring the dynamics of thought. 4th European Phd Complexity School, European Conference on Complex Systems (ECCS), Jerusalem, Isreael. Lisiecka, K. Ziembowicz, M. (2007) Measuring the stream of consciousness – Vallacher and Nowak’s Mouse Paradigm (referat) Quality Of Actions For Human Development, REAS conference, Zagrzeb, Chorwacja.